Alleson Athletic 557PWY Girl's eXtreme Mock Mesh Softball Shorts - Closeout. This is a solid color body 7" inseam short that is made of 100% eXtreme mock mesh Cationic colorfast polyester with moisture management fibers (medium weight). It features contrast color self-material piping starting on the side seams and curving to the back. Other features include a 1 1/2" covered elastic waistband with inside drawcord. 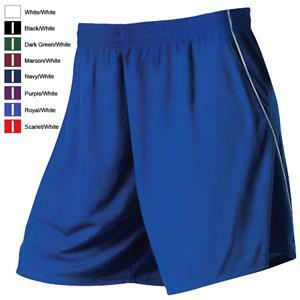 This is a solid color body 7" inseam short that is made of 100% eXtreme mock mesh Cationic colorfast polyester with moisture management fibers (medium weight). It features contrast color self-material piping starting on the side seams and curving to the back. Other features include a 1 1/2" covered elastic waistband with inside drawcord. See item # E21922 and item # E21925 for coordinating jerseys. WAIST 21-22" 23-24" 25-26" 27-28"